"Dominators, Cynics, and Wallflowers by Robert W. Kahle, PhD"
You need to allow them to talk at your meeting, but unless you can maintain control, they will disrupt your efforts and leave everybody feeling like the meeting was wasted time. If this situation sounds familiar to you, you need Bob Kahle's new field guide to the misbehavers! 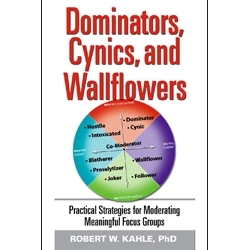 Dominators, Cynics, and Wallflowers will help you recognize ten basic bad actors, and give you effective tools to quickly neutralize their hijinks. Improve your success in leading groups, or managing any small group discussion, without resorting to a whip and a chair. 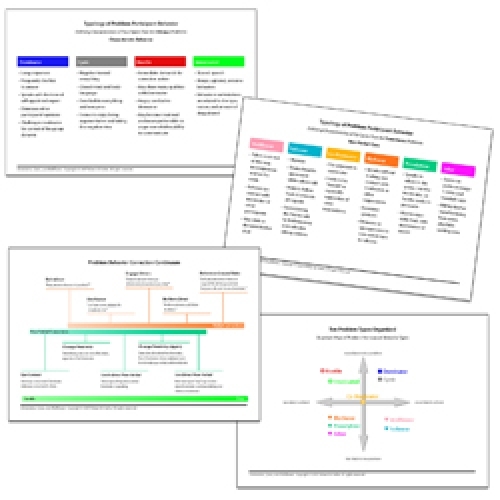 Dominators, Cynics, and Wallflowers gives you tools to help you quickly identify the potential problem participants in your group and then to fend off their misbehavior. The book includes several war stories from moderators with years of experience, When you read some of these stories, you may even feel that some of the misbehaviors you face aren't so bad. Contributors of war stories include J. Robert Harris, Chris Kann, Kristin Schwitzer, George I. Balch, Lynne Doner, Hy Mariampolski, Elyse Dumach, and the author. As an exclusive addition when you buy Dominators, Cynics, and Wallflowers directly from Paramount, you receive a "tool kit"--a set of cards that you can easily keep with you to prompt you about what to say and how to act even before a potential problem participant starts to be disruptive. Bob Kahle is an expert at conducting focus groups, in-depth interviews, and surveys to get critical input from customers, suppliers, and thought leaders -- whether in person at facilities nationwide, or using the latest virtual tools. Bob's workshop on handling problem behavior among respondents is among the most popular at QRCA chapter meetings and conferences. As a bonus to our customers, PMP is offering a companion tool kit with every copy of this must-have handbook. Take these sturdy 6x9 reference cards on the road with you. 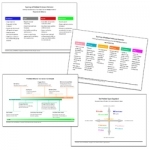 Use them to prepare for potentially difficult groups or later to explain to clients or your boss why you used certain tactics during a group meeting. FREE when you purchase a copy of Dominators, Cynics, and Wallflowers directly from PMP. This tool kit is NOT available from other booksellers. Additional card sets can be ordered separately.